COLUMNIST Andrew Vine and his group of friends all concluded that, if a General Election was called tomorrow, they would be unable to vote for the established parties (The Yorkshire Post, August 7). They have lost all faith in the Tory, Labour and Lib Dems. It left them with that question “who would I vote for?”. Each described themselves as floating voters, living in Yorkshire. All agreed that their concerns are those of countless others across Yorkshire and beyond – job security, paying the mortgage, the NHS, good schools and public services and living in a decent society. Then the answer must surely be a vote for the Yorkshire Party. It must be obvious to Mr Vine and his friends that successive governments have failed Yorkshire. Failed us in many ways, including school funding, transport, health, and infrastructure spending. A report from the Institute for Public Policy Research (IPPR) makes shocking reading, comparing public spending in the north to the prosperous south. The Yorkshire Party is a regional political party promoting a devolved administration for all of Yorkshire and 18 of the 20 councils are behind this. The CBI and the TUC agree it is time Yorkshire took control of their own destiny as successive governments have let us down. Small and medium-sized businesses in Yorkshire are fully supportive. Senior political figures such as Michael Heseltine promote the merits of local people making decisions for all of the people in Yorkshire. From: Michael O’Sullivan, Victoria Street, Allerton Bywater, Castleford. YOUR editorial ‘Security comes before Brexit’ (The Yorkshire Post, August 8) misses out on two points – Nato and the Germans. Since 1949, Nato has been the alliance keeping Europe free, with the US bearing the brunt of the costs and the Germans, the richest nation in Europe, paying far less than they can afford. Donald Trump has told the Germans that this ‘free riding’ is over, and they do not like it. As a Leave voter, I am in favour of strong defence forces in Europe with the UK included. 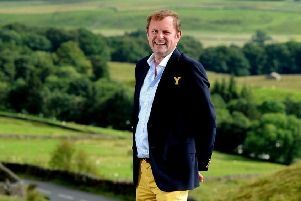 WHO is taking charge of Yorkshire’s Brexit preparations? We can’t leave it to the Government. They hate us. All the more reason that we get behind the One Yorkshire plan with a very clear remit on economic growth and prosperity.